Do a search for the word “scrappy”, and the obvious site shows up as #1 (at least as I’m typing this). NYTimes.com story on the death of hand-drawn animation at Disney. Some good background info I hadn’t heard…and a surprisingly positive spin. Anyone Got a Spare $4,145? If so, you can buy yourself an animation drawing from Gertie the Dinosaur. Posted by HarryPosted on September 8, 2005 2 Comments on Anyone Got a Spare $4,145? Sunday Comics in the New York Times! Good grief! Everybody’s favorite comics-free newspaper will soon be carrying 10 pages of comics. The New York Times’s Sunday magazine is introducing a front-of-the-book funnies section, apparently to feature work by new-wave types such as Chris Ware. This article has more details. If this thing is really going to appear every week, it’s pretty amazing–and I think it’s a great idea. Posted by HarryPosted on September 6, 2005 Leave a comment on Sunday Comics in the New York Times! So earlier today, I was bicycling through downtown Sausalito, and out of the corner of my eye who did I spot sitting in a toy store window but…Oswald the Rabbit. Looking rather jaunty and relaxed. In Sausalito, Oswald (Oswalds, actually–there were a bunch of him) had plenty of company. The store has a nifty selection of strange Japanese Disneyana, classy Tintin and Babar figures, and other offbeat playthings likely to be of interest to visitors to this site. 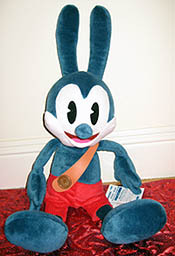 Anyhow, you won’t be surprised to hear that I pedalled home with an Oswald in my backpack. The floppy-eared little guy has rarely looked better. It’s encouraging to think that a cartoon character who was pretty much washed up more then seventy years ago can make a comeback–take heart, Scrappy!